The Lower Platte Missouri Tributaries (LPMT) Groundwater Model is being developed to assist the Department in performing its annual evaluation of the expected long-term availability of surface water supplies and hydrologically connected groundwater supplies in both the Lower Platte River and Missouri River Tributaries basins that have not been designated as fully appropriated or overappropriated. 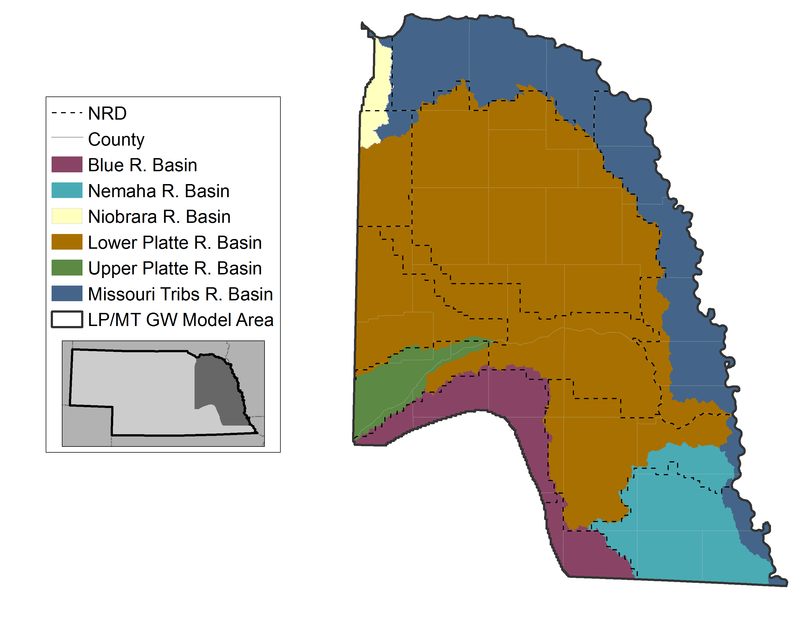 This numerical groundwater model will be used as a tool to calculate the groundwater depletion component of the NeDNR’s evaluation of the appropriation status in the Lower Platte River and Missouri River Tributaries basins by evaluating the effect of well pumping on stream baseflow. Prior to development of the LPMT Groundwater Model, NeDNR carried out a hydrologic study of the Lower Platte and Missouri Tributaries basins. The Lower Platte/Missouri Tributaries Study includes land areas that drain directly to the Missouri River downstream of the Niobrara River, as well as the easternmost portions of the Lower Platte River Basin. This study began in 2012 as a preliminary assessment to determine the feasibility of developing a groundwater model for this area to help water administrators understand the impacts of land use development on streamflow. A conceptual model was developed thereafter, which determined that there is sufficient hydrologic and hydrogeologic data in this region to support a groundwater model. As a result of this study and conceptual model, which revealed significant hydrologic and hydrogeologic differences across the study area, it was decided to develop two separate models for the eastern portion of the state: the LPMT model and the Nemaha Model.